These deep ocean blue sapphire gemstone stud earrings from Apples of Gold Jewelry are a great way to add a little extra flair to your daily routine. Dark blue, almost oceanic sapphire meets 14K white gold to create a design that sparkles and shines the whole day through. 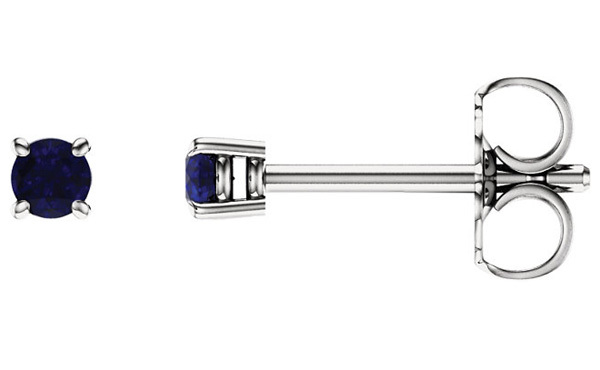 The genuine sapphire stones in the earrings measure 2.5mm in size, and are round cut. The white gold is a wonderful contrast to the round cut sapphire, and the earrings are held in place securely with a friction push back closure design. We guarantee our 2.5mm Blue Sapphire Stud Earrings, 14K White Gold to be high quality, authentic jewelry, as described above.